Leo ORNSTEIN: A Morning in the Woods (1971); Danse Sauvage (Wild Men’s Dance), Op. 13, No. 2 (1913); Piano Sonata No. 4 (1924); Impressions of the Thames (1914); Tarantelle (1960); Piano Sonata No. 7 (1988); A Long Remembered Sorrow (1964); Suicide in an Airplane (1913?). Janice Weber (piano). Naxos 8.559104 (http://www.naxos.com). Also available at ArkivMusic. Leo ORNSTEIN: Suicide in an Airplane (1913? ); A la Chinoise, Op. 39 (1911? ); Danse Sauvage, Op. 13, No. 2 (1913); Poems of 1917, Op. 41 (1917); Arabesques, Op. 42 (1921); Impressions de la Tamise, Op. 13, No. 1 (1913); Piano Sonata No. 8 (1990). Marc-André Hamelin (piano). Hyperion CDA 67320 (http://www.hyperion-records.co.uk/). Distributed in the US by Harmonia Mundi (http://www.harmoniamundi.com/HMboutique/). Also available at ArkivMusic. With all that sibilance — Satanism, Scriabin, Stravinsky and Schoenberg — it’s an excerpt that deserves repeating! Ornstein’s career as composer and pianist blossomed at a time when it seemed possible to express anything with music. Debussy and Ravel added rich colors to the pianistic palette and Scriabin and Schoenberg were stretching the boundaries of tonality. Ornstein’s first concert performances included not just his novel works, but drew upon a vast repertoire that included Schoenberg’s Opp. 11 and 19, sonatas by Korngold, d’Indy and Scriabin, Ravel’s Sonatine and Gaspard de la nuit, Albéniz’s Iberia, and Debussy’s Images. 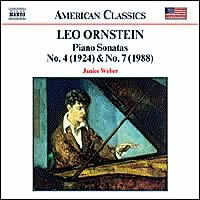 Ornstein retreated from the concert stage in the 1920’s and founded a music school in Philadelphia with his wife, but kept composing into the 1990’s. He was born in 1892 or 1893, and when he died in February 2002, he was either 108 or 109 years old. Ornstein’s music is long overdue for re-examination and reappraisal. These two CDs, with Janice Weber on Naxos (8.559104) and Marc-André Hamelin on Hyperion (CDA 67320), sample Ornstein’s vast piano oeuvre and show conclusively that he was more than just a futurist flash in the pan. Ornstein was a continuation of the romantic piano tradition — even if he did have a fondness for flamboyant gestures and colorful titles. Both Weber and Hamelin play some of the short pieces that got Ornstein branded as a troublemaker, as well as more serious and extended works. Weber programs two complete piano sonatas: No. 4 from 1924 and No. 7 from 1988. Despite the vast span of years that separates them, both are tonal and lyric. The first movement of Sonata No. 4 is reminiscent of Scriabin’s middle sonatas and its second movement has a tune that could have been written by Noël Coward. The third movement is a calm and mysterious lento preceding the vigorous melodies of the fourth and last movement. Sonata No. 7 is in a romantic idiom but its first movement has a keystone-cop level of activity with its two themes, the first in the vein of early Berg, the second more aggressive and Prokofiev-like. The central slow movement picks up the Bergian material, and the closing movement returns to the hearty energy of the first movement. Hamelin plays but one Ornstein sonata, his Eighth (and final composition), a wry autobiographical work written in 1990 when he was in his late nineties. The outer movements are mostly serious and the second movement consists of several light and nostalgic pictures. Tuneful melodies are harmonized unexpectedly, and romantic lines are spiced with dissonant chords and clusters. The movements are labeled with somewhat surprising titles, indicative of Ornstein’s flair for juxtaposing different modes of expression. How can a movement called “Life’s Turmoil and a Few Bits of Satire” fail to amuse? And what of a berceuse subtitled “Half-Mutilated Cradle”? Hamelin fills out his exploration of Ornstein with two sets of descriptive works, the Poems of 1917 (10 pieces) and Arabesques (9 pieces). Both the Poems and the Arabesques are comprised of short items, most in ABA form. With titles like “The Sower of Despair,” “The Wrath of the Despoiled” and “A Dirge of the Trenches,” the Poems (dedicated to Leopold Godowsky) use expressive tonal colors embellished by clusters and dissonant chords to describe despondent and bleak moods. The Arabesques are not as disheartening, but dreamy and mysterious: “Chant of Hindoo Priests,” “Pompeian Fresco” and “The Wailing and Raging Wind” are some of the titles. Like the Poems, tonal melodies are harmonized colorfully but with a greater use of whole-tone scales and augmented triads. Still, there is a lot of splash, as in “Passion,” the 26-second flourish comprising the seventh arabesque. 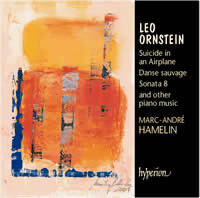 Both Weber and Hamelin play Suicide in an Airplane and Danse Sauvage, two showpieces that cemented Ornstein’s iconoclastic reputation near the start of last century. Suicide in an Airplane means something else to us after September 11, 2001, but it is still possible to hear in this work a lonely single-propeller airplane, fashioned out of canvas and wood, flying low over a barren landscape. Danse Sauvage opens with aggressive and fast-moving clusters that are kept in rapid motion throughout. Hamelin plays with greater abandon, but Weber manages to coax more of a melody out of the clusters, and she adds tiny but important pauses or breath marks into the flow of the music. Steffen Schleiermacher’s “The Bad Boys!” (hat ART CD 6144) perpetuates Ornstein’s reckless and nontraditional image (Cowell and Antheil are similarly portrayed). He also programs Suicide in an Airplane and Danse Sauvage. Interestingly, Schleiermacher’s timings are consistently longer. If he took a repeat, I couldn’t tell. Here are timings for Suicide: Weber: 3:26, Hamelin: 3:46, and Schleiermacher: 5:24; and Danse: Weber: 2:57, Hamelin: 2:48, and Schleiermacher: 3:20. Ornstein seems a logical step in Hamelin’s rapacious exploration of the piano literature and I hope he records more of it. Ornstein’s challenging music is well suited to his temperament and abilities. But the sonatas, written on a larger scale, are more satisfying with a greater development of moods and musical ideas. Of these three sonatas, No. 7 on Weber’s disc is my favorite. Weber seems to have lived with this music a bit longer; she appears with the Lydian String Quartet on New World Records 80509-2 with a very fine performance of the big Piano Quintet (1927). That disc’s companion work, String Quartet No. 3 (1976), is not as focused. These two recordings promise to be the start of a welcome Ornstein resurgence. His piano music is only mildly piquant and could be played on the radio without causing the phones to ring. Like Ives, Ornstein accompanied tunes with colorful harmonies, but Ornstein is more refined and less inclined to ramble. George Crumb is another American whose piano works would be complemented by Ornstein’s. Severo Ornstein, son of the composer, has been editing and publishing the legacy, so sheet music should be more widely available. I hesitate recommending either recording over the other, and with their duplications, they balance each other very well. 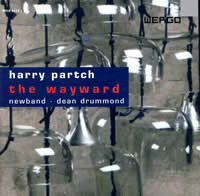 Harry PARTCH: The Wayward (1941-43 / 1954, 1955, 1967). Stephen Kalm (baritone); Robert Osborne (bass-bar. ); Newband: Frank Cassara, Dominic Donato, Gregory Hesselink, Nina Kellman, Tom Kolor, Michael Lipsey, Nelson Padgett, Bill Ruyle, Dean Drummond (cond.). Wergo 6638 2 (http://www.wergo.de/). Distributed in the US by Harmonia Mundi (http://www.harmoniamundi.com/HMboutique/). Also available at ArkivMusic. Harry PARTCH: Eleven Intrusions (1946-50); Dark Brother (1943). Dean DRUMMOND: Before the Last Laugh (1998); Congressional Record (1999). Robert Osborne (bass-bar. ), Allison Sniffen (sop. ), Stefani Starin (flute), John Whitfield (cello), Christopher Oldfather (synthesizer); Newband: William Anderson, Frank Cassara, Dominic Donato, Gregory Hesselink, Nina Kellman, Tom Kolor, Michael Lipsey, Nelson Padgett, Bill Ruyle, Dean Drummond (cond.). Innova 561 (http://www.innova.mu/). Also available at ArkivMusic. Like a tin of sardines and a working flashlight, everyone needs some Harry Partch (1901-1974). With his bizarre collection of self-made instruments, strange scales, and texts derived from his own experiences “on the rails” during the Great Depression, Partch is always colorful, occasionally crude and consistently wacky. He’s a great American product, and always worth a listen. Music written for one-of-a-kind custom-built instruments restricts performances, and some of Partch’s instruments are also impractical to pack up and move. Partch’s cloud chamber bowls are sections cut from twelve-gallon glass carboys (what bottled water comes in) originally used by the Radiation Lab of the University of California at Berkeley, and the bass marimba — to judge from booklet pictures — looks to be about six feet high and at least eight feet wide, and requires the player to stand on a bleacher-like platform to play it. For most of us, experiencing Partch’s music is thus limited to recordings, and these two new releases add to the Partch legacy. The Wayward collects four pieces: Barstow, a sequence of eight hitchhiker inscriptions taken from a highway railing in Barstow, CA; San Francisco, the cries of two newsboys during a foggy night in the 1920’s; The Letter, a Depression-era message from a hobo; and U.S. Highball, the longest piece, the story of a transcontinental hobo trip. The work’s momentum is propelled by the voices of Stephen Kalm and Robert Osborne, who impart the perfect amount of huskiness and vulgarity to the goings-on. Barstow has always been a favorite Partch work, its eight random and sometimes desperate inscriptions set off by a perky ritornello that makes the music gently ironic. Partch’s odd instruments diffuse the bleakness of The Letter, and U.S. Highball (at 26:13 it’s longer than the three that come before) is a masterpiece of the vernacular. I now know more about riding the rails in the 1930’s than I ever thought possible. The Wayward appears on CRI CD 752, in the second volume of CRI’s Harry Partch Collection, but it’s actually four separate recordings strung together in a different order (U.S. Highball and San Francisco were taped in 1958, The Letter in 1972, and Barstow in 1982). Understandably, some of the CRI recordings sound as if they were taped in a living room (there are audible splices and microphone pops), and the voices (including Partch’s own) are less polished, but the instruments have a surprising immediacy. U.S. Highball is most unexpectedly different: On CRI the travelogue is more fragmentary and disturbing, whereas Newband’s performance is much less manic. Of course the CRI recording is valuable and historic, but I prefer Newband’s polish. Newband plays down the humor of Barstow, but the folks on CRI act like they’re in Spike Jones’ band. With its self-conscious announcement of the piece’s titles, Eleven Intrusions is similar to Barstow, but Partch sets a diverse array of texts, from Lao-tze to Ungaretti, against a wide array of musical sources including Greek scales and a Zuni (native American) melody. Dark Brother is a setting of the last paragraphs of Thomas Wolfe’s God’s Lonely Man. It’s a gloomy piece with Robert Osborne intoning the text over dark bass colors. Dean Drummond was a high-school student when he started working with Partch. After formal music study, he returned to Partch and participated in the premieres of several works, including Delusion of the Fury. Like the elder American iconoclast, Drummond favors working with exotic instruments and odd scales, but his music sounds more Eastern like Lou Harrison’s, and he prefers a vertical approach to building harmonic textures. He now is responsible for maintaining Partch’s instrument collection at Montclair State University (Montclair, NJ). Before the Last Laugh is the reworking of music for a silent film. Flute, cello and synthesizer are combined with a zoomoozophone, an instrument invented by Drummond (129 aluminum tubes with 31 pitches per octave), and the harmonic canons, one of Partch’s instruments. The work starts gently but builds to a sustained level of vibrancy, and the flute, the only high-register instrument capable of sustaining pitches, provides balance to the lower registers. Drummond is also a prescient commentator on our times. Congressional Record is a setting of several excerpts from the United States Congressional Record: a speech made by Jesse Helms proposing the abolishment of the National Endowment for the Arts (NEA), the actual Senate bill to abolish the NEA, a speech introducing the Plumbing Standards Improvement Act of 1999, and some non-salubrious bits from Kenneth Starr’s Independent Council Report. In just 13 minutes, we learn how absurd and powerful our government is. Here, too, Osborne carries the work forward, maintaining his dignity while reading the words of Sen. Helms and recounting the exploits of Bill and Monica. It is a colorful and enjoyable work. Thirsty for more Partch? Newband has recorded other works by Partch and Drummond for Mode, there’s CRI’s Harry Partch Collection, and Innova has the remarkable six-part Enclosures series consisting of videos, CDs and books that document Partch’s life and work. 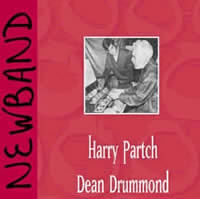 For more information also see http://www.harrypartch.com, http://www.newband.org/ and http://www.deandrummond.com/.